When it’s time replace your windows, there are lots of things to consider. One of the most important factors when upgrading your windows is to choose the best style to suit your home. Across the UK, there are a plethora of different property types. From modern new-build homes to traditional Georgian and Victorian properties, their architectural style can differ greatly. With such a variety of property types, it’s essential to make a well-informed decision about your new windows. At Oakley Green, our extensive product list ensures that we can provide the perfect window for any style of home. We install casement windows, sliding sash windows, and flush sash windows across a wide geographical area. Our years of industry experience and in-depth product knowledge allow us to offer all our customers expert advice on the best windows for their home. Timber – The perfect material for traditional properties. Aluminium – Sleek and stylish, great for more contemporary homes. uPVC – Durable, attractive and our most cost-effective option. During the Victorian era, thousands of residential properties were built across Bristol. From Totterdown in the south of the city to the central bohemian area of Stoke’s Croft and the northern suburb of St. Werburgh’s, Bristol’s streets are full of attractive Victorian terraced homes. Victorian properties were often built over three or more floors. Many of these tall houses have now been converted into several self-contained flats. If you’re lucky enough to live in a Bristol Victorian property, you’ll probably enjoy the large sliding sash windows which are synonymous with the period. If your home is fitted with its original timber sliding sash windows, you may have noticed that they’re not as efficient as you’d like them to be. If your home is located in a designated conservation area or is a Listed building, you’ll need to seek advice from your local authority about whether you’ll require planning permission to replace your windows. If you do, we can install sympathetic timber windows which will tastefully uphold your home’s character while improving its performance. Although Reading has its roots in the Roman era and also grew rapidly during the 19th century, it is its modern expansion which is perhaps, most noteworthy. In 1977, the Lower Earley development became the largest private housing development in Europe. Reading has continued to steadily grow in size ever since, leading to a wealth of modern properties across the town. If you live in Reading, it’s quite likely that your home is relatively modern. For modern properties, aluminium windows are an excellent option. In the past they were sometimes thought of as more suitable for commercial installations. In recent years, however, they’ve become increasingly popular in residential properties. This should perhaps come as no surprise. 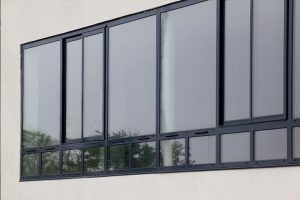 With aluminium windows you can enjoy an ultra-modern aesthetic, A+12 energy efficiency rating, extremely low maintenance finish, durable powder coat exterior in any colour you like, and slimline appearance to boost natural light intake. At Oakley Green, we install high quality windows, doors, and conservatories across Wiltshire, Berkshire, and Somerset. For the majority of our customers, uPVC windows are the most popular option. There are many reasons for this. uPVC windows provide homeowners with lots of benefits and are perfectly suited to almost any type of home. As you can see, choosing your new windows takes some careful consideration. It’s also a great idea to get some expert advice to ensure that you make the right decision for your home. If you’re planning to replace your windows and you’d like to find out more about Oakley Green, get in touch today. For any information about our range of products and services, call us on Newbury 01635 877 959, Maidenhead 01189 401 975, Bristol 0117 910 9500, or contact us online.